Did you know...the program fee for a Bright Lights class covers only 54% of the actual program cost for a student to participate in one half-day class or full-day camp? Bright Lights staff and volunteers work year-round to generate funding to pay for the remaining cost of more than 2,400 class and camp openings offered each summer. As our registration date (April 1) approaches, we wanted to share some tips about what you will see in our new mobile-friendly registration system. One of those items is our Voluntary Price Option, which will come up as a choice during registration. Why is this optional pricing available? Bright Lights Voluntary Price Option program is an easy way to help the program and other students when registering for classes and camps. 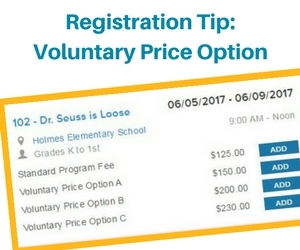 Selecting one of these optional prices gives families the opportunity to help close the gap between the actual cost of $230/$460 per half-day class or full-day camp and the standard program fee we charge of $125/$250. Your participation is appreciated—you can make a difference! Learn more about the program (including answers to frequently asked questions). And remember: Registration begins Saturday, April 1 at 8:00 AM! Please note: The price options are completely voluntary and will in no way influence the experience your child will receive while attending Bright Lights.